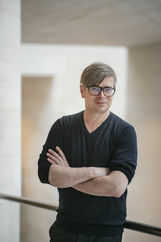 Jaroslav Rudiš, born in 1972, is a writer, scriptwriter and dramatist. He studied German and history in Prague, Zürich and Berlin and has worked as a teacher and journalist. In 2012-2013 he was the Siegfried Unseld guest professor at the Humboldt University in Berlin. His novels Grand Hotel, The Stillness in Prague, On the End of Punk in Helsinki, National Route and The Sky Under Berlin were originally written in Czech. He was awarded several prizes and two of his novels have been made into films. Winterberg's Last Journey is the first novel he has written in German.